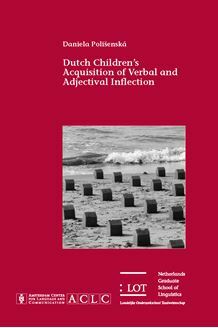 This book presents a study of the acquisition of verbal and adjectival agree­ment inflection in typically developing, monolingual Dutch children. The au­thor shows that Dutch children correctly inflect verbs for person and number with both existing and non-existing verbs from the age of three onward. The results of a preferential listening experiment reveal that perceptual sensitivity precedes production: Infants are able to discriminate between correct and in­correct number agreement from the age of 18 months. Dutch children acquire adjectival inflection as early as verbal inflection, even though adjectival inflec­tion is more complex, comprising gender, number and definiteness. Analyses of children’s performance with adjectival inflection point to substantial asym­metries between the development of grammatical knowledge, on the one hand, and lexical knowledge, on the other. While children acquire grammatical rules early, it takes them much longer to learn the relevant lexical properties of nouns (e.g. grammatical gender). It is argued that salience factors related to form, function, and frequency play a role in the development of inflectional morphemes. Methodologically, this study stresses the importance of meticulous testing and fine-grained analyses. The outcomes of the experiments are a welcome and valuable complement to existing spontaneous speech data. The book is of in­terest to scholars who work in the field of language acquisition, developmental psychology, as well as to linguists studying inflectional morphology.